A pub by the river in Wandsworth, just next to Wandsworth Bridge. This pub occupies an odd site, tucked away from both the bridge and from the main road, in an area otherwise dominated by industrial plots, hemmed in by concrete. However, it has an extensive riverside terrace and garden area, over several levels (including a BBQ and separate, smaller bar area). The view of the river is blocked by a large wall on the other side of which is the Thames Path. Inside, the place takes up a couple of rooms with a bar placed between them, a mixture of couches and tables with TV screens. The entrance is on the river side of the pub, into what was once the back room (and still referred to as such by the pub). The front room (i.e. behind the bar, away from the main entrance) is therefore generally a quieter area for drinking. There is also a dining room off to the side. On a March 2009 visit, the inside was full with people watching rugby on TV, and outside the BBQ area was not operational, though it was in full swing on a Summer evening visit in July 2010 (and listed as being open until 10pm). They also had a sign warning that food service did not extend beyond a point halfway through the beer gardens, meaning there were several large empty tables near the back (at the riverside), so we could seat our group of 15 or so. When the BBQ is functioning, order numbers are announced over a tannoy, and customers come to collect their order from the BBQ area (the dining room menu is not served to the outdoor seating when the BBQ is going). There are six handpulls for ale at the bar inside, including Young's ordinary and Special, and Bombardier. 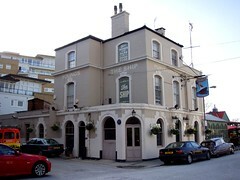 In July 2010 they also had Sambrook's Wandle and Junction ales (£3.45/pint in July 2010). They also had Addlestones cider on, at £3.75/pint (Mar 2009). Service was quick enough, and friendly, but it was very busy, so Ewan waited a little while to be served. Food is served noon-10pm daily, though none was sampled on our visit in March 2009 photo of menu. The same hours are used for the BBQ when it is operational. Prices in July 2010 hovered around £10 for a burger to £13-15 for main courses (including ribs, grilled fish and some others), while steaks come in at £18 for 250g or £25 for 350g. An Irish music session takes place in the back room on Tuesday evenings from 8:30pm. Last visited by Ewan and Kerry, 6 July 2010. Opening hours and food times taken from Young's website, March 2009. Last edited 2013-05-10 08:02:15 (version 10; diff). List all versions. Page last edited 2013-05-10 08:02:15 (version 10).